Prepare to have your mind blown away with these Cheesy Cauliflower “Bread” Sticks. Low carbin’ it never tasted so good! Low carb, gluten free, grain free. Awesome! Caution: Prepare to have your mind blown as I introduce you to Cheesy Cauliflower “Bread” Sticks. Please don’t click the little “x” to close this window, just stick with me on this one for just … a …..few….. minutes…. So have you heard the craze as of late with Cauliflower Pizza? I did several months ago, and I sort of dismissed it and figured it HAD to be too good to be true. Sort of like during baseball season when I *think* my Chicago Cubs are going to win a game…. and then it turns out too good to be true. Ya know? You get your hopes and then just end up disappointed. I didn’t want to be disappointed, but I just figured there was no way on this Earth that cauliflower could pass as a crust for pizza, and a decent crust no less! But then I started this whole carb cycling thing…. and then I started to crave pizza…. and then I finally decided it was worth my time and effort to experiment with “Cauliflower” used in place of bread to see what all the hype was about. Instead of taking the pizza route though, I thought, why not try the same concept, but with breadsticks. And guess what? It did NOT disappoint. Now don’t get me wrong, you can obviously tell that you’re not eating bread. But, the cauliflower is a pretty darn good replacement. The key is to get the “crust” to actually crisp up, and if done right, it will! So how do you get the crust to crisp up? One key is to make sure you “drain” the cauliflower really good. Detailed instructions are below, so read carefully. Are you still with me on this one? I’m telling you, low carbin’ it never tasted so good! If you’re feeling a little adventurous, seriously give this a try! It’s low carb, gluten free, and grain free. Awwweeeesome! 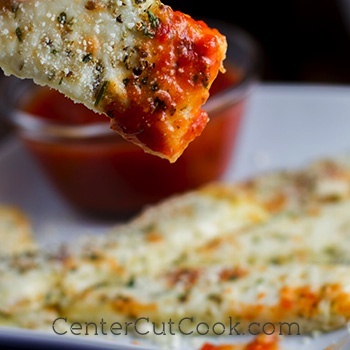 One recipe makes an 8×11 inch rectangle which can be cut into as many breadsticks as you’d like. In a large saucepan, heat one inch of water until it boils. Add in the cauliflower rice, cover with a lid, and allow it to steam for 4-5 minutes. Use a fine mesh strainer to drain the cauliflower. Allow it to cool for a few minutes, then place the cauliflower “rice” in a clean dish towel and squeeze as hard as you can to remove any excess water. It may look like all the water is removed, but definitely don’t skip this step as there is hidden excess water. Once the cauliflower rice is drained really well, dump it into a large bowl. To the cauliflower rice, add 1 cup mozzarella cheese, 1 egg slightly beaten, 1 teaspoon dried oregano, 1 teaspoon dried basil, and 1/4 teaspoon salt. Place in the oven for 35-40 minutes, or even longer until the crust is golden brown and firm. Remove the crust from the oven and allow it to cool for about 10 minutes. Then top the crust with remaining 1 cup shredded mozzarella cheese, and 1/2 teaspoon Italian Seasoning. Return the pan to the oven and bake for another 7-10 minutes, or until the cheese is melted. Cut into “breadsticks” and serve with warm marinara sauce for dipping.